I’m very happy to announce that I’ve just won the Jeju International Brass Competition for euphonium on the very nice island of Jeju in South-Korea. This competition has grown into one of the biggest solo competitions over the world and I guess it’s even the biggest one for euphonium. The trip started really well with a very nice travel experience. When I arrived at Amsterdam airport they told me the flight to Seoul was fully booked and offered me an upgrade to business class. The trip couldn’t start better, with excellent food and a comfy chair. Korea was really hot and humid, no ideal circumstances to play. It took me two days to adjust, exactly the time I had before the first round began. 56 euphonium players tried their luck there, so I felt sorry for the adjudicators. After this round the players who made it to the second round were announced by head of Jury Steven Mead. We had to play the second round two days later. In this round they had cut the number of young players to 16. So it was a very tough competition indeed. I really liked the repertoire of the second round. I had to play Soliloquy XI by Wiggins and Concerto per Flicornobasso by Ponchielli. I have a lot of great memories about that last piece. All the players knew the adjudicators were only allowed to let 3 or 4 players through to the final so you could feel the tension when Steven Mead came out to announce the results. I was very nervous too. It’s very strange but I’m always more nervous for results than for playing. Even with band competitions. I was very happy to go to the final together with Misa and Corentin which are both good friends from previous competitions. That’s the nice thing about competitions. You get to know young players from all over the world and there is no rivalry at all. We all become very good friends and listen to each other’s rehearsals and even comment and help a little bit where we can. The final is a special thing. 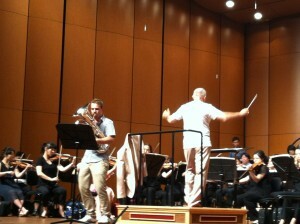 They give you the opportunity to play with Symphony Orchestra which is very special for a euphonium player. You don’t often get the chance to play with a full orchestra. Symphonic Variants by James Curnow was the piece for the final. A great challenging piece for euphonium and orchestra. I had to play number 3 cause we keep the same order throughout the competition. The orchestra did a very good job and I was happy with the performance so what can you expect more? I would like to thank my parents for all the support through the years. Without them I wouldn’t be able to undertake such trips and perform like this or do anything of the playing I do now. First of all, I would like to wish all my followers and friends a Happy New Year and the best of luck for 2012! It promises to be an exciting year, both with the band and as a soloist. At the moment, I’m organizing two big trips: one to Australia and another to Japan. In the mean time you’ll have plenty of opportunity to see me performing with Exit Brass of course! We’ve got some big projects in the pipe line, there. So, all in all, it will be a good and busy 2012! Another great project is the release of my first album Move Their Mind, which is really taking off. The long awaited presentation at the Belgian Nationals was a big succes. It sold about 200 copies in one weekend! And it seems that we’ll have to order a second print later this year. This fantastic year was possible thanks to my great family, which is very close to me and supports me in everything I do. So I want to thank my mum and dad and my sister Nele, and of course also my fantastic girlfriend for all their support. I’m not going to mention everybody by name, here, (that would take us too far) but I have a great ‘entourage’ and I would like to thank them sincerely and expressively. Steven Verhelst wrote a very nice solo piece in conmemory of my dear niece. I will try and record it soon this year and put a video online. Stay tuned on my website and facebook group. And don’t forget Twitter of course. I’m very happy that I can announce that I’ve been chosen as ‘player of the year’. I was already very happy to be nominated amongst superb soloists by the famous website 4barsrest. I would like to thank everybody for voting. 2011 has been a fantastic year for me. And I’m very happy that you all supported me! Hope I can make you all happy with my playing in 2012 too. Keep an eye on the event calendar for some great events this year. An early morning it was with a number 4 draw. The band was at breakfast around 7 o’clock to rehearse at 8. Warming up the lips with a few hymn tunes, after fridays heavy rehearsal when we ran trough the piece 2 times, the band sounded really good. A nice morning walk to the RAH and then in the changing rooms. You could feel the incredible atmosphere from the Nationals. It was the 100th jubileum of the competition and my debute. The band played really well on the stage and I’m sure they have put a lot of effort in the piece. I’m very proud to announce you that the adjudicators chose me for the ‘best instrumentalist’ prize. Just to keep you informed…I’m currently in France. I’m playing a concert with the brass band Mediterrannee conducted by Roy Terry. The band is based in Antibes, where we had a rehearsal last night. The concert will be in the church of Nice. I forgot to send Tom Boonen an invitation. Monaco is very close though. At the concert I’ll play the Golland No1 concerto and after that I’ll join the band as they don’t have a solo euphonium at the moment. After the break I’ll play Lament by Karl Jenkins and the famous Bravura by Peter Graham. I’m looking forward to this concert. Second time in france as a guest artist for Buffet-Crampon. I wont be there for long as I have a regional competition with my band Brass Band Heist. We will play on sunday night in Turnhout. Battle Creek and Bello Gallico is on the program. Should be a busy but very good day. On monday I’ll fly to my friends in Beaumaris again, to put the last bits together to go to the Royal Albert Hall for the weekend. I already did one weekend of rehearsals with them and the band sounded great. Will be interesting to see them a few weeks after that again. I believe the band even sound much better. I’m looking forward to perform Paul Lovatt-Cooper’s Breath Of Souls in the Albert Hall. Just to keep you informed about my CD project… He will be there very soon! So stay tuned on all my media channels. Guess who wins the OPEN this weekend!! Besson is doing a contest about this years British Open Championships. As the main sponsor the launch a competition where you can win several nice prizes. Like Steven Meads latest CD Fandango and David Childs CD Celtic Charm. You also can win FREE tickets for concerts by besson artist and can you can experience the European Championships with Besson next year in Holland. What do you have to do? Just go to the besson link below and guess who the top 3 bands will be in this years competition. The competition will close on Saturday 3th of September at 8 am so be quick!! I am very proud to announce on my website that I have won the second Lieksa Euphonium Competition. It was a very tough competition with strong competitors from all over the world. The competition started on the 21st of August with the first 21 competitors out of 38. The resthad to play the next day. As you could read on my not updated blog, I had to play on the second day. As draw number 34 I was one of the last players of the day on Saturday. The Vivaldi Sonate went really well and I was happy with Three Euphonics too. After I had played I went for a swim in the nice Lake of Lieksa with a few friends as it was really hot in Finland. The results were announced later that day in the Brass Week Office. I was very happy when they announced my name together with the other 7 players that made it too the second round later in the week. There were only 8 out of 38 left to play the pieces of the second round. These players came from all over the world with two french guys, a spanish and Portuguese euph player, Japan, Australia and an American. The draw stayed the same so I had to play second last. It was a though program and it was so hot on stage. The second round went ok. But I had some nerves when I went to the Brass Week Office again to find out who the three players are that made it to the finals. A bit unlucky but the guy that announced the results turned his paper the wrong way so everybody could see the names of the finalists before it was announced. I was very happy to be in the final with my friend from the US Greg Battista and my new friend Kyohei Ando from Japan. Now we had two days to prepare for the finals on thursday. With a chat with the conductor and a rehearsal with the finish Guard band of Helsinki on the day before the final. It was only a short rehearsal but the three of us did a good job. The conductor was very nice and patient so we worked very well with the wind band. The piece of the final was the lovely concerto for euphonium by John Golland. I really enjoyed playing in the church of Lieksa. After the concert the chairman of the Lieksa Brass week announced the results. I’m really happy and want to congratulate the two other finalist for their brilliant performance!!! What a nice evening it was with a self organized party with all the 38 participants. I would like to thank my family and close friends for all their support and believe in me. Without them this victory wasn’t possible. Also a big thank you to my friend and roommate Kevin Van Giel and my two british mates Matt White and Lewis Musson for all the support during the week. I’m finaly in Lieksa. Sharing a room in a very nice hotel with Kevin Van Giel. The internet hardly works and the rooms are quiet small. But we’ll manage it for a week. The first thing we did in the morning was going to the draw. Kevin drew number 11 so he is playing tomorrow. And I drew number 34 out of 38. That means that I have a day more to prepare. I’m playing the first round on Saturday. We both had a practice in the Lieksa office and are now ready to have a rehearsal with the accompanist and we can test the hall later on the day. I’ll try to post some more during the day. To be honest…there is not so much to do around here apart from practicing. So we will have to do it. Keep an eye on the blog folks.